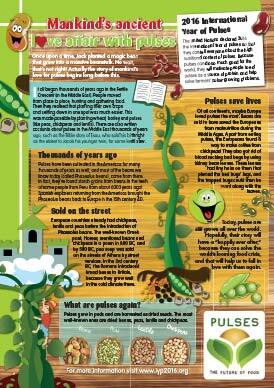 Help kids learn about pulses with these visuals. 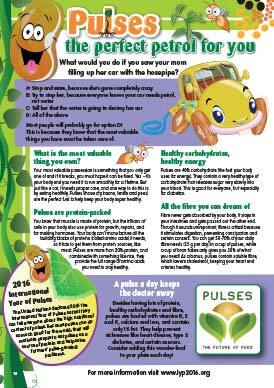 These documents are aimed at kids aged 8-14 and include information about the health benefits of pulses, how pulses are grown, their history, and the environmental benefits of eating more pulses. 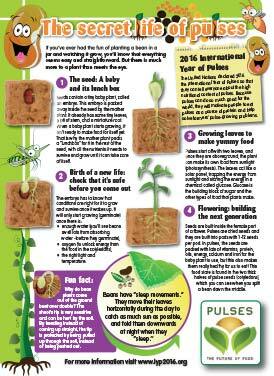 Love Pulses in 2016! 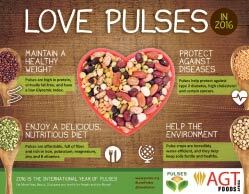 Find out more details about the health benefits of Pulses. Once upon a time, Jack planted a magic bean that grew into a massive beanstalk. No wait, that’s not right! Actually the story of mankind’s love for pulses begins long before this. It all began thousands of years ago in the Fertile Crescent (in the Middle East). People moved from place to place, hunting and gathering food. Then they realised that planting their own crops and settling down in one spot was much easier. This was made possible by planting wheat, barley and pulses (like peas, chickpeas and lentils). There are also written accounts about pulses in the Middle East thousands of years ago, such as the Bible story of Esau, who sold his birthright as the eldest to Jacob his younger twin, for some lentil stew. Your most valuable possession is something that you only get one of and if it breaks, you must hope it can be fixed. Yes – it’s your body and you need it to run smoothly for a lifetime. But just like a car, it needs proper care, and one way to do this is by eating healthily. Pulses (those dry beans, lentils and peas) are the perfect fuel to help keep your body super healthy. If you’ve ever had the fun of planting a bean in a jar and watching it grow, you’ll know that everything seems easy and straightforward. But there is much more to a plant than meets the eye. Have you ever looked at the beans on your plate and wondered why you have to eat them? They don’t look as healthy as vegetables, and they’re definitely not as nice as that yummy slice of pizza! Many people just give them a skip, but now you will discover how wrong people are about beans. Those ordinary-looking beans on your plate belong to a food group called the “pulses.” Pulses, which belong to the legume family, and grow in pods and are harvested as dried seeds. They’ve been grown all over the world for thousands of years already! 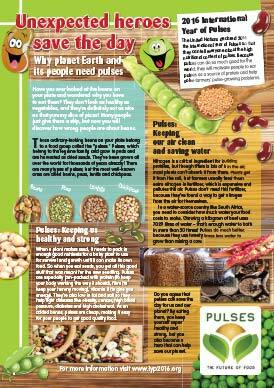 There are many types of pulses, but the most well-known ones are dried beans, peas, lentils and chickpeas.